Chase coupons & promo codes can be found here for all Chase promotions of $100, $150, $175, $200, $250, $300, $350, $400, $500, $600, and $1250 cash bonuses. The offers are quite easy to qualify for and only require you to open an eligible account and meet certain requirements such as signing up for an email code or setting up a minimum direct deposit. Chase has offers for business checking, consumer checking, and savings accounts, so you’re bound to find the right offer. Chase is the second largest bank in the nation ranked by the number of branch locations. They currently have 16,000 Chase ATMs and nearly 5,000 branches throughout these states: AZ, CA, CO, CT, FL, GA, ID, IL, IN, KY, LA, MI, NJ, NV, NY, OH, OK, OR, TX, UT, WA, WI, and WV. Get $200 as a new Chase checking customer, when you open a Chase Total Business Checking® account with qualifying activities. Early Termination Fees: Must wait at least 6 months, otherwise your bonus will be deducted at closing. Enter your e-mail and Chase will e-mail you a bonus coupon offer to bring into a nearby branch. Open a Chase Total Business Checking® account. Deposit $1,000 or more in new money within 20 business days of account opening. Maintain at least a $1,000 balance for 60 days from the date of deposit. The new money cannot be funds held by Chase or its affiliates. Complete 5 qualifying transactions within 60 days — debit card purchases, checks paid, Chase QuickDepositSM, ACH (Credits and Debits), wires (Credits and Debits). After you have completed all the above checking requirements, Chase will deposit the bonus in your new account within 10 business days. You can only receive one new business checking account opening related bonus per calendar year and only one bonus per account. Employees of JPMorgan Chase Bank, N.A. (“Chase”) and their affiliates are not eligible. Chase reserves the right to withdraw this offer at any time without notice. Bonuses are considered interest and may be reported on IRS Form 1099-INT (or Form 1042-S, if applicable). Get a $200 bonus when you open a new Chase Total Checking® account and set up direct deposit. In addition, get a $150 bonus when you open a new Chase SavingsSM account, deposit a total of $10,000 or more in new money within 20 days, and maintain a $10,000 balance for 90 days. Take advantage of both offers to get up to $350 when you open a new Chase Total Checking® account with Direct Deposit and/or open a new Chase SavingsSM account, deposit $10,000 or more in new money and maintain a $10,000 balance for 90 days. Open an account online. If you’re opening in-branch, be sure to use the offer page to print out the coupon. Have a direct deposit made into this account within 60 days of opening. There’s no specified minimum direct deposit amount. Once all requirements are met, Chase will deposit the bonus in your new account within 10 business days. Open an account online and deposit a total of $10,000 or more in new money within 20 business days of opening. If you’re opening in-branch, be sure to use the offer page to print out the coupon. Maintain at least a $10,000 balance for 90 days from the date of deposit to get your bonus. This new money cannot be funds held by Chase or its affiliates. The Chase Total Checking® account is one of the more popular accounts from Chase bank due to the low minimum daily balance to waive the service fee. The Chase Premier Plus CheckingSM account offers more features, but this account will meet most customers’ needs. Make sure you meet the monthly requirement to waive the service fee on the Chase SavingsSM when linking to the Chase Total Checking®. Enjoy $300 as a new Chase checking customer, when you open a Chase Premier Plus CheckingSM account and set up direct deposit. Earn interest on your checking account balance. Open a new Chase Premier Plus CheckingSM account online. If you’re opening in-branch, be sure to use the offer page to print out the coupon. 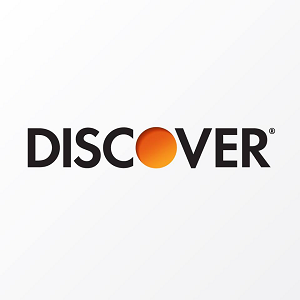 Have a direct deposit made to this account within 60 days of account opening. There’s no specified minimum direct deposit amount. After all requirements are met, Chase will deposit the bonus in your new account within 10 business days. Have automatic payments to your qualifying linked Chase mortgage from your Chase account. Payments set up through Online Bill Pay do not qualify. Mortgages must be in good standing and be first mortgages with servicing retained by Chase. If you can meet the monthly requirement(s) to waive the monthly service fee, I recommend getting the Chase Premier Plus CheckingSM account. This bonus offer is one of the best you can obtain and offers great account features. Chase won’t charge you on your first four non-Chase ATM transactions per statement period. Plus, this account allows you to earn interest on your checking account balance. If you have a linked personal Chase Savings account, you won’t have to worry about the monthly service fee. Checking offer is not available to existing Chase business savings clients, local, state or federal Government entities or agencies, Not for Profit organizations, Political Action Committees, or those with fiduciary accounts, campaign accounts, or whose accounts have been closed within 90 days or closed with a negative balance. Employees of JPMorgan Chase, N.A. and their affiliates are not eligible. Get a $150 bonus when you open a new Chase SavingsSM account, deposit a total of $10,000 or more in new money within 20 business days, and maintain a $10,000 balance for 90 days. Savings offer is not available to existing Chase business savings clients, local, state or federal Government entities or agencies, Not for Profit organizations, Political Action Committees, or those with fiduciary accounts, campaign accounts, or whose accounts have been closed within 90 days or closed with a negative balance. Get $100 as a new Chase checking customer when you open a Chase College CheckingSM account, enroll in paperless statements and complete 10 qualifying transactions within 60 days of account opening. 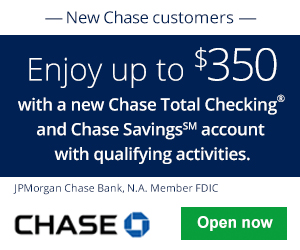 Open a new Chase College CheckingSM account online with a minimum $25 deposit. If you’re opening in-branch, be sure to use the offer page to print out the coupon. Enroll in paperless statements and complete 10 qualifying transactions within 60 days of account opening. Qualifying transactions include: debit card purchases, online bill payments, checks paid, Chase QuickDepositSM, Chase QuickPay®, or direct deposits. After you have completed all the above requirements and the 10 qualifying transactions have posted to your account, Chase will deposit the bonus in your new account within 10 business days. For college students 17 to 24 years old at account opening with proof of student status. College student must be 17 – 24 years old to open a Chase College CheckingSM account and must provide a valid student ID or proof of enrollment/acceptance, college name, and expected graduation date at account opening. Bonus is considered interest and will be reported on IRS Form 1099-INT. If the checking account is closed by the customer or Chase within six months after opening, they will deduct the bonus amount at closing. Chase SapphireSM Checking is offering you a 60,000 bonus points when you open a new banking account and meet specified requirements. Below is all the information you need to earn your Chase Sapphire Checking Bonus Points! Chase Private Client is offering you a $1,250 bonus when you join. Below is all the information you need to earn your Chase Private Client bonus! Monthly Service Fee: There are no Chase membership fees, but you must maintain a minimum relationship balance of $250,000. Meet with a Private Client Banker upgrade your account to Chase Private Client. Within 45 calendar days, transfer a total of $250,000 or more in new money to a combination of eligible checking, savings and/or investment accounts, and maintain the balance for at least 90 days. Receive $1,250 within 10 business days. Your money will be direct deposited into your account. Offer not available to existing Chase Private Client customers. You can only participate in one Chase Private Client Checking, Sapphire Checking or You Invest new money bonus in a 12 month period. Coupon is good for one time use. Keep an average beginning day balance of $75,000 or more in any combination of this account and linked qualifying deposits/investments. Chase College CheckingSM Account: For college students 17 to 24 years old at account opening with proof of student status. When you maintain a daily minimum balance of $1,500 or more or if you maintain a linked Chase Private Client Checking or Chase Premier Platinum Checking personal account. Otherwise only $12 when you enroll in paperless statements. Chase Private Client: There are no Chase membership fees, but you must maintain a minimum relationship balance of $250,000.